Nadine Bridges has dedicated herself to working with and advocating for under-served youth and marginalized communities for the past 19 years. She is passionate about empowerment, social justice, and inclusiveness work. 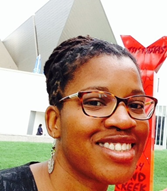 Previously, she worked as a youth and family engagement manager/clinical case manager for Denver Urban Scholars. Nadine volunteered in Nicaragua with the Peace Corps in the youth development sector; started her own mentor program during her undergraduate years at the College of Charleston; and taught Spanish at a charter school in Charleston, South Carolina. Currently, Nadine works as an adjunct professor at the Graduate School of Social Work at the University of Denver. Nadine earned her BS in Biology from the College of Charleston and her Master of Social Work from the University of Denver along with a Certificate for Social Work with Latinos/as.